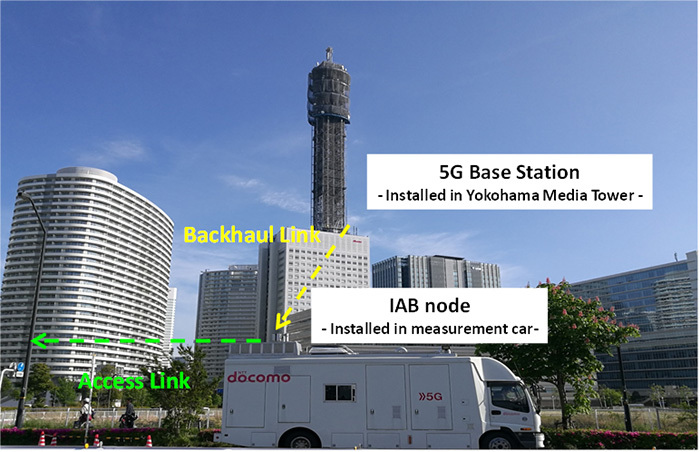 Yokohama, Japan, May 22, 2018 --- Huawei and NTT DOCOMO, INC. marked another milestone in their joint 5G trials by completing a successful trial of Integrated Access Backhaul (IAB) technology using the 39GHz millimeter wave (mmWave) band. 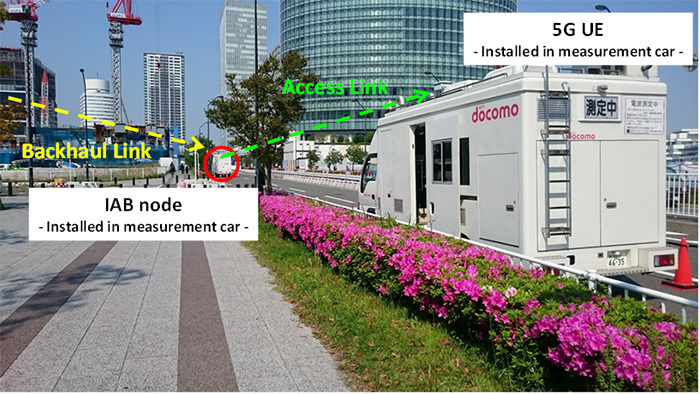 The field trial, which took place in Yokohama, Japan's Minato Mirai 21 waterfront area, involved wireless backhauling functionality between a 5G base station (IAB-donor) and a 5G relay node (IAB-node) using 39GHz signals, from where the IAB-node achieved wireless access with mobile user equipment (UE) via 39GHz signals. The trial demonstrated that IAB can significantly improve mmWave coverage and capacity. Throughput exceeding 650Mbps with a low latency of 1.6 ms was achieved with user equipment that was outside the range of the base station. Both the relay node and user equipment were under mobility condition during the tests. Conventionally, mmWave signals offer only limited coverage due to high propagation loss and interference from buildings. The need for a narrow directional beam to focus transmission power can further complicate efforts to achieve wide area coverage under non-line-of-sight conditions. The 3GPP standards organization is now considering IAB technology as a 5G New Radio (NR) standard. The technology involves the use of a compact focal lens antenna made with metamaterials to achieve advanced beamforming (maximum gain of 31 dBi) that concentrates radio waves in a specified direction for long-distance transmission. Beamforming mitigates interference between the wireless-backhaul and wireless-access links, and also enables simultaneous data transmissions over the same frequency. In addition, IAB-nodes enable low-latency data transmissions through fast beam-switching for the uplink and downlink, and they efficiently coordinate radio resource scheduling between the backhaul and access links. The IAB trial system involved a 5G base station (IAB-donor) and a 5G relay station (IAB-node). The IAB trial system demonstrated that IAB technology dramatically improves mmWave coverage and capacity. 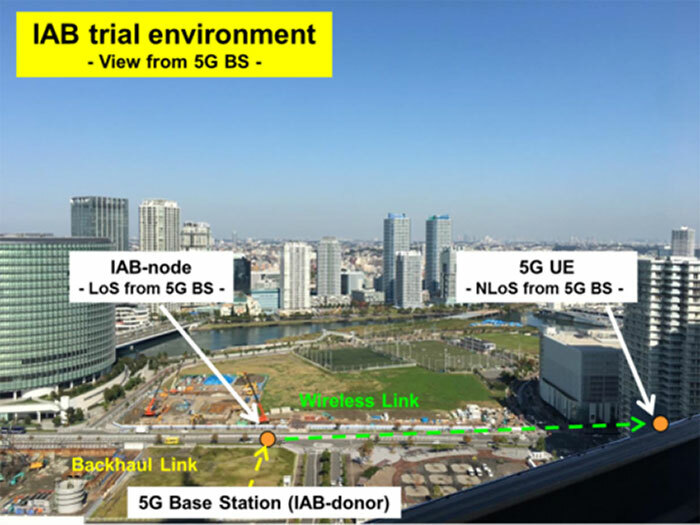 It also proved that IAB facilitates the use of high-speed, low-latency 5G communication among tall buildings and on isolated islands or in mountain regions where laying fiber presents problems. 5G signals were sent to the 5G user equipment (UE) via the 5G relay station (IAB-node). Huawei and DOCOMO have been collaborating on 5G innovation through a series of successful large-scale outdoor trials that began in December 2014. The two companies have been systematically verifying key 5G technologies, including Massive MIMO for enhanced mobile broadband (eMBB) and ultra-reliable, low-latency communications (URLLC), for advanced vertical applications. To date, the joint efforts of Huawei and DOCOMO have produced many world's-first achievements, a track record that they plan to expand upon going forward.